The new 4-inch display is the first change to the screen size of the iPhone (s AAPL) in its five-year existence, and thousands of developers are rushing to adjust their apps accordingly. For established app makers, this is a minor inconvenience — not trivial, but not a great burden either. But the barriers to implementing the new display changes aren’t equal for all developers, as I found out when talking to a few this week. You have likely already seen some apps roll out updates that are appropriately sized for the iPhone 5 display: Instagram’s(s FB) update was ready on Tuesday, less than five days after the first iPhone 5 went on sale in the U.S. Other app makers were let in on the design changes early so Apple had an example to show off their work at the iPhone’s introduction two weeks ago: CNN(s TWX) and OpenTable(s OPEN) both had already implemented the display size changes. Some app developers will keep the same design targeted at earlier iPhone screens, but modify the app so that it fills the whole display — that way it won’t be “letterboxed” with black bars on top and bottom, Apple’s temporary solution. For established developer teams, this can be relatively easy. Social travel app Trover, for example, anticipates that implementing the changes will take maybe two weeks from the day they got their hands on an iPhone 5 (for testing purposes) in addition to some other modifications to its app. The app’s current design lends itself naturally to a taller screen, Trover CEO Jason Karas told me. It just means less scrolling for users, and won’t necessitate a wholesale redesign the way it did for app developers who built for previous model iPhones and wanted to port their app to the larger 9.7-inch iPad. 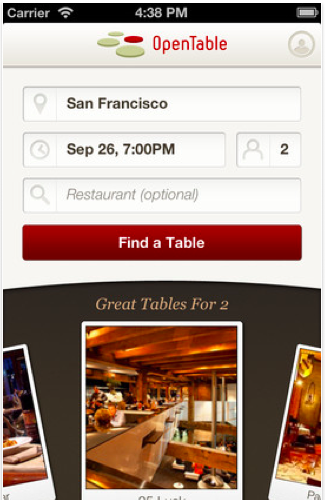 Some will choose to redesign anyway so that the elements of the app better take advantage of the roomier screen — OpenTable’s is a good example. But it’s not so simple or quick for everyone. What do you do if your company is based in a country that won’t get the new device for several weeks? Many other apps will have a head start on you. That’s what Readdle, based in Odessa, Ukraine, is facing. Despite having some of the top-selling business apps on the App Store, the team doesn’t have an iPhone 5 yet. They have a handful of apps, and while the update to the new screen size will be “really straightforward,” that won’t be the case for all their apps especially ones that have heavily customized user interfaces, said CEO Igor Zhadanov. The more difficult ones, like the Printer Pro app, will take “about five to eight days at most,” he said. You’re also at somewhat of a disadvantage if you’re a startup with a brand new app and have very few resources. Routehappy, a company whose iOS app launch I covered just a few weeks ago is focusing on the iPhone, but its small crew is still squashing bugs and doing major upgrades its new app. With a new iPhone display, they have to drop everything and make their app look like it belongs on the iPhone 5. And then there’s the approval process. With everyone resubmitting to the App Store, there’s somewhat of a traffic jam. “Due to high number of submissions, approval time has extended up to two weeks, which is sad,” said Readdle’s Zhadanov. So if your favorite app is still letterboxed for now, some patience is necessary. Its developers are likely working on it. There are just a few obstacles — geography, time, and resources — to overcome first. The updated SDK includes the iOS simulator which has the taller iPhone 5 screen, so it’s not necessary to wait for a handset. We were able to update our app in about half an hour, submitted and it was approved by Apple on the Friday 21st Sep release date. The changes involved adding 2 new images and rebuilding some linked libraries because of the CPU architecture changes. Our app uses customised default UI elements – http://www.serverdensity.com/iphone/ – so it’s easier than it might be with more graphical/3D apps. We also have a dedicated iOS engineer so that’s not to say it will be straightforward for everyone. Using letterboxed apps on an iPhone 5 is noticeable but is much less of a pain than the change from non-retina to retina graphics, so it’s less urgent for developers too. Well, if youâ€™ve designed anything for Android in conjunction with your iPhone app, you have already had to visit this scenario. Not a huge deal, but it will take a bit to fix. Flexible design comes to the iPhone! Now picture the horror if they had not only made the screen taller but wider. At least this way any unchanged apps remain letterboxed and work just like they did on the 4-series phones. I’m fairly convinced that was one key reason they went with taller, not wider.